NEW: Due to last second cancellations and no-shows, we are implementing a REFUNDABLE $50 deposit to secure your registration for Gingerbread Lane. Click the button below to make your online deposit. This will be refunded to you after the Festival. Note: Cancellations after Oct. 15th or no-shows will not be refunded their deposit. October 9: Designer Night Come and Go at the Western Development Museum. 7:00 pm - 8:30 pm. Get ideas and tips about making your gingerbread display. People's Choice Award Winners will be notified on Friday, Nov. 30th and provided 4 general admission tickets for Saturday, Dec. 1. Enter in one or more of the 3 NEW categories. LIMITED NUMBERS of entries for each category. 0 - 3 years of previous entries to the Festival's Gingerbread Lane. If you're new to this then this is the right category for you. 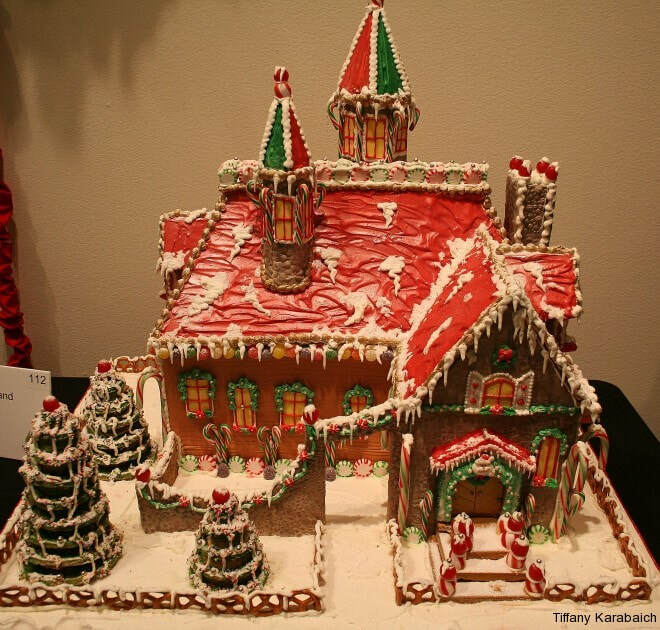 This category is for people who are new or have had a little experience in the past with building gingerbread displays. 4 years or more with entries to the Festival's Gingerbread Lane... OR...If you are an experienced gingerbread display builder then this is the right category for you. You may have previously entered in the Festival's Gingerbread Lane or not. If you feel you are experienced to compete in this category then we welcome you! Professional bakers and people who make a living from creating amazing desserts. We welcome professionals to show off their talents through this new category.Professional entries will get signage with their company logo next to their display. Professional entries can be made with items other than gingerbread. We encourage professionals to showcase their specialty products in a Christmas-themed display. Please note that the creation will be on display for several weeks so should be made with materials accordingly. Rules for the size/base of the display are listed below. 1. The base of the Gingerbread Display cannot be larger than 22" x 22"
3. The display must be made of Gingerbread and must be constructed WITHOUT interior support. 4. All decorations must be made from edible products, except the base. Lighting is permissible. Please put access to battery packs for lighting in the FRONT of your display. We will try to turn your lighting on and off but cannot guarantee that throughout Festival week. If you put lighting on the display you can get a pass that enables access to the Festival daily so you can check your display. 5. All displays must be dropped off at the Western Development Museum on Thursday November 23, between the hours of 2 pm and 8 pm. 6. Judging will be done by people’s choice selection. Ballots are on the general admission programs handed out at the Festival. Winners are announced on the Festival website. 7. Each Gingerbread Display will receive 4 General Admission tickets to the Festival. 8. The Gingerbread Displays become the property of the Festival of Trees and are sold during Festival. 9. Cancellations for entries must be received no later than October 23rd as this is when our program goes to the printer. NO SHOWS AND LATE CANCELLATIONS WILL NOT BE INVITED BACK THE NEXT YEAR. 10. Please help us to price your display for sale. Any information or suggestions you have for pricing should be included when you drop off your display. 11. Unsold displays will be gifted to local charity groups identified by the Festival of Trees.